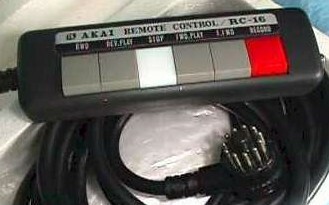 Akai RC-16 wired remote. Compatible with the GX-280(D/D-SS), GX-285, X-360D, GX-365D and GX-370D. 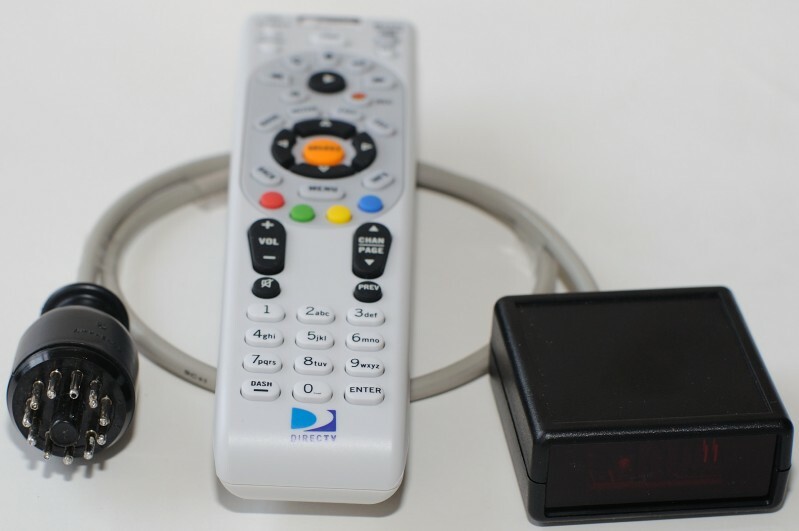 These decks require a dummy plug when no remote is connected (1-11, 5-6). I currently do not make a wireless remote adapter for these decks. Original RC-16 picture. Akai RC-17 $75 (or on eBay for $80) Wireless version of the Akai RC-17. 6 functions: Record, Rewind, Reverse Play, Stop, Play and Fast Forward. Compatible with the GX-270(D/D-SS), GX-400(D/D-SS/D-PRO). 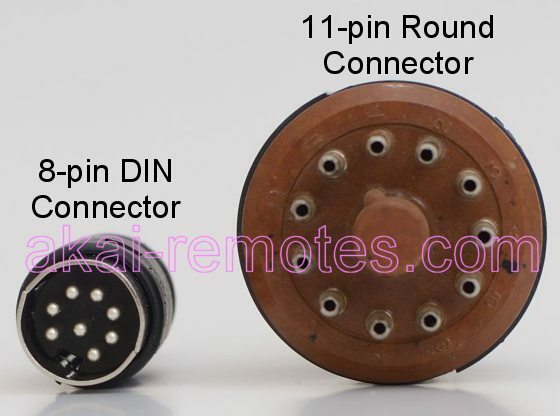 This remote has the 11-pin round connector on the end and requires an external AC adapter for power. Original RC-17 picture. Akai RC-18 $80 (this one is not sold on eBay) Wireless version of the Akai RC-18. 6 functions: Record, Rewind, Reverse Play, Stop, Forward Play and Fast Forward. This remote has the 11-pin round connector on the end and requires an external AC adapter for power. 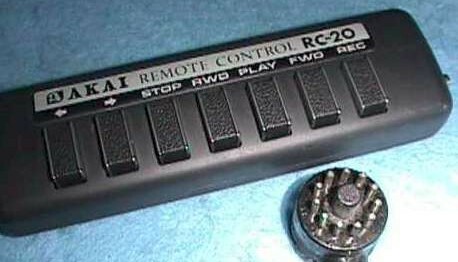 Many decks that use the RC-18 can use my RC-70 remote. See compatibility list below. Original RC-18 picture. Akai RC-19 $80 (this one is not sold on eBay) Wireless version of the Akai RC-19. 7 functions: Record, Rewind, Reverse Play, Stop, Forward Play, Fast Forward and Pause. This remote has the 11-pin round connector on the end and requires an external AC adapter for power. Many decks that use the RC-19 can use my RC-70 remote. See compatibility list below. Original RC-19 picture. 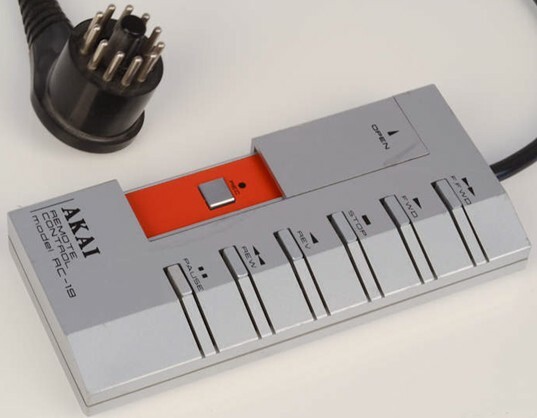 Akai RC-20 Compatible with the X-330(D). I do not make a wireless remote adapter for this deck. 7 functions are supported on with this remote (reverse, forward, stop, rewind, play, fast forward and record) Some decks that use the RC-20 can use my RC-70 remote. See compatibility below. Original RC-20 picture. 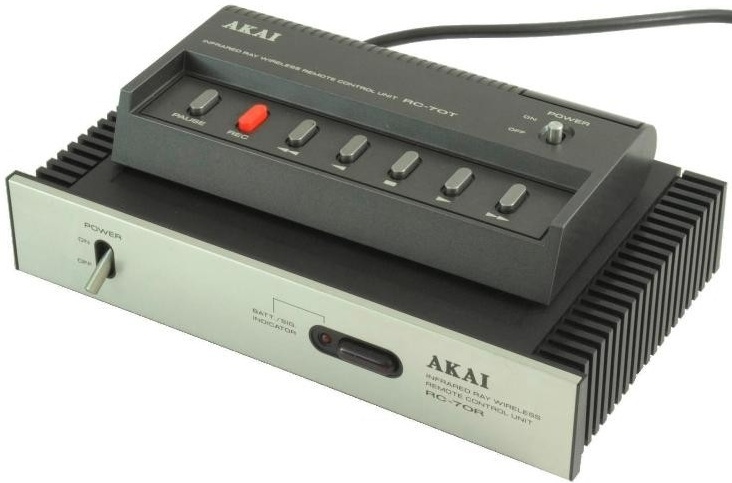 Akai RC-70 $80 (or on eBay for $85) Up to 7 functions are supported depending on the deck: Record, Rewind, Reverse Play, Stop, Forward Play, Fast Forward and Pause. Compatible with Akai Reel to Reel decks: GX-255, GX-266II, GX-270(D/D-SS), GX-520, GX-620, GX-625, GX-630(D/DB/D-SS), GX-635(D/DB), GX-636(/DB), GX-650(D) and Akai cassette decks GXC-570D, GXC-570D II, GXC-760D, GX-F80 and GX-F90. This remote has the 11-pin round connector on the end and requires an external AC adapter for power. Original RC-70 picture. 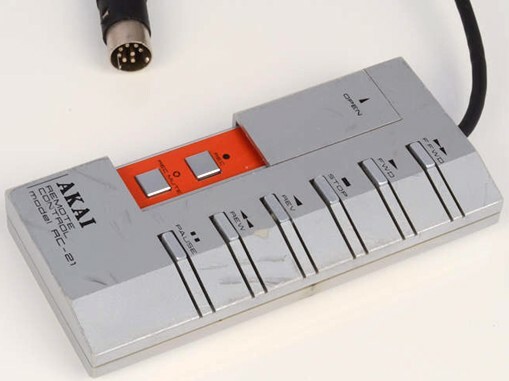 Akai RC-90 (RC-21) $74 (or on eBay for $79) Wireless Remote adapter for Reel to Reel: GX-77, GX-77BL, GX-646 and GX-747(dbx). 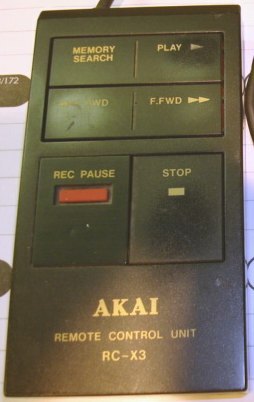 Akai RC-91 (RC-31) DISCONTINUED - Wireless Remote adapter compatible with decks that use the RC-31 or RC-91. Up to 8 functions: Forward, Reverse, Fast Forward, Rewind, Stop, Record/Pause, Auto Fader and Auto Mute. Compatible with GX-F31, GX-F51, GX-F71 and GX-F91. Akai RC-92 (RC-32) $75 (or on eBay for $79) Wireless remote adatper compatible with GX-7, GX-9, GX-R6, GX-R66, GX-R70, GX-R70EX, GX-R88, GX-R99, HX-3, HX-A3X, HX-A5X, HX-R5 and HX-R44. This wireless remote adapter has the U-shaped 8-pin DIN connector on the end. Up to 7 functions: Forward, Reverse, Fast Forward, Rewind, Stop, Record and Auto Mute. No AC adapter required as power is supplied by the tape deck. 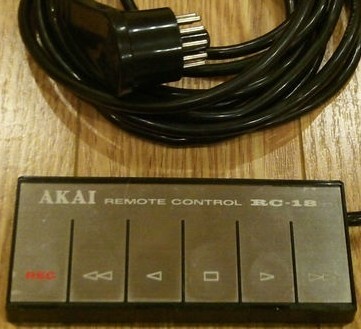 Akai RC-X9 (RC-X3) Remote for GX912, MG1212 and MG1214. Functions: Play, Stop, Fast Forward, Rewind, Record-Pause and Memory Search. I do not make a compatible remote and it is not being considered for development. Original RC-X3 picture.